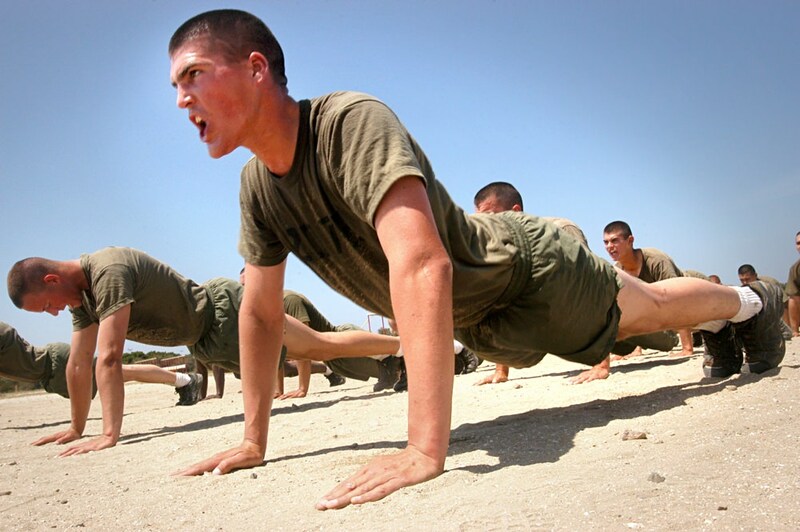 Smarter Ways to Do Push-Ups | Valet. The push-up is an old school, barebones exercise. But it's an essential muscle-building move that's incorporated in every well-toned athlete's training program because it delivers results. Push-ups target your arms, chest, back and core. Which means they're the key to looking better with your shirt off. What's more, you can do them anytime, anywhere and easily up the intensity (not to mention, the results) with a few simple adjustments. After all, adding some variety to your workout is encouraged by most trainers. Routinely cranking out the same old moves is as bad for your motivation as it is for your muscles. Herewith, three solid variations on the classic push-up. Plant your hands slightly farther apart than your standard push-up position. Lower yourself down towards your left hand, then slide horizontally over to the right arm and push up to the starting position. Reverse the movement and repeat, going back and forth between arms. Want bigger, more toned arms? Forget the bicep curls and focus on the tricep (which is actually the bigger arm muscle). The diamond push-up is your ticket to tricep stimulation. Bring your hands together, touching the tips of your thumbs and index fingers, forming a diamond shape. The close hand position will also make the abs and core work harder to stabilize due to the narrow base of support. Focus on quality form, lowering yourself slowly and smoothly. You can also do these on your knees if you're looking to simply isolate your triceps. Treat your push-ups like deadlifts and you'll not only see more muscle gain, but you'll get a whole lot better at push-ups in general. Lower yourself down to the floor and come to a dead stop. Then push yourself off the ground with good form without relying on momentum. A full one-second pause on the ground will ensure this happens. Here's an old trainer trick: Take the number of solid push-ups you can do, and divide that in half. Complete five sets of that number, resting 60 seconds between each set. (For example, if you can do 8 perfect push-ups, you'll do five sets of four push-ups, followed by a minute rest.) Your next workout, deduct 5 seconds from your rest. Eventually, you'll be down to no rests in between sets, enabling you to do 20 solid push-ups in a row. You can shred fat and increase strength with this four-minute routine that requires no equipment. Ignore your legs and you're giving up massive muscle building and fat shredding potential.